Welcome to Cookie Week! Just in time for holiday baking season, a few of your favourite food bloggers have gotten together for a week-long cookie extravaganza. Trust me, this is going to be fun (and fattening). 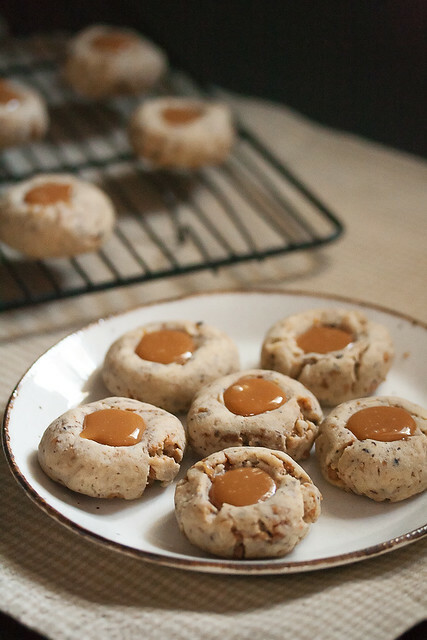 I figured I’d get things started with these chubby little Coffee Toffee Thumbprint Cookies. I got the inspiration from Greg’s Ice Cream, one of my regular haunts back in high school and university. Greg’s is known for making seriously delicious homestyle ice cream in all sorts of flavours, including roasted marshmallow, grape-nut cereal, and even the occasional foray into truly wacky flavours like beer. The one flavour that holds a special place in my heart, though, is their coffee-toffee ice cream, which is basically their coffee ice cream dotted with large chunks of Skor bars (also known as Heath bars, if you’re ‘Murican). The coffee ice cream and toffee bits balance each other beautifully, one roasty and creamy and faintly bitter, and the other sweet and nutty and crisp. Even years later, that particular flavour combination takes me right back to the many afternoons I spent on a wooden bench under the neon rainbow sign in the back corner of their old shop, giggling with my best friends or making shmoopy faces at my university boyfriend. It’s basically like a time machine in scoopable, lickable, edible form. For these cookies, I started with my basic sweet cookie dough, and flavoured it with instant coffee and Skor chips. And since that wasn’t enough, I figured I’d up the ante with a little dot of chewy caramel right in the centre. They’re quite different from the ice cream that inspired them, but they still have that wonderful balance of roasty, bitter, nutty and sweet, not to mention a lovely contrast between the tender cookie and the gooey caramel. And like the ice cream that inspired them, they’re incredibly addictive. Coffee-toffee isn't just a fun tongue twister - it's also a great flavour pairing for this variation on the classic thumbprint cookie. Preheat the oven to 350F, and line two large cookie sheets with parchment paper. Using a stand mixer fitted with a paddle attachment, cream together the butter and brown sugar on medium speed until well combined. Beat in the egg and vanilla extract. In a second mixing bowl, combine the flour, espresso powder, baking powder, salt and toffee bits. Add to the wet ingredients, and beat on low speed until combined. 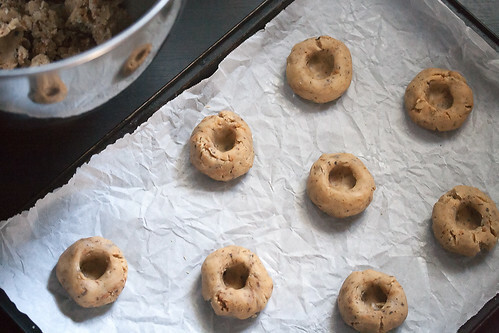 Roll the dough into 1-inch round balls, and arrange on prepared baking sheets. Using your thumb, press a deep indent into the middle of each ball. Bake in preheated oven for 10-12 minutes, or until golden-brown. Let cool on the baking sheet for 2-3 minutes, then transfer to a wire rack to finish cooling completely. 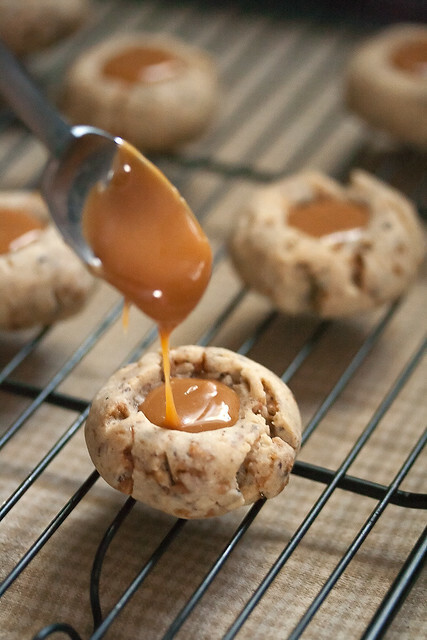 Spoon a small amount of caramel into the centre of each cookie. Let cool for 15-20 minutes before serving to allow the caramel to set. I have made cookies with caramel in middle and the caramel tends to come out to hard after cooled completely. When as t a m I doing? 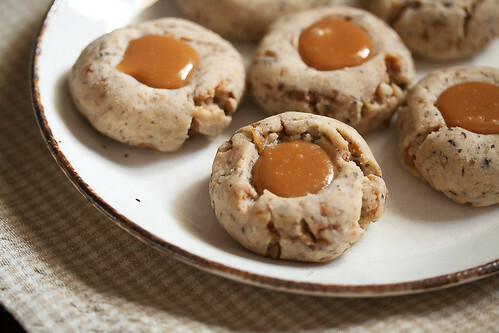 It’s hard to say without knowing what other recipes you’ve tried, Jacqueline, but I can tell you that the caramel in the middle of these cookies will be on the chewy side rather than soft or melty (basically, a lot like the texture of the caramels before they were melted). If you want a softer centre, I’d suggest substituting a thick caramel sauce like dulce de leche or cajeta. I just made these following the recipe exact..I am an avid baker, and mine came out totally flat? I didn’t chill my dough before shaping and baking, but my kitchen is fairly cold, so that may explain the difference. If your kitchen is on the warm side (or if the dough looks very soft), a half-hour in the fridge might fix the problem. Made these for a cookie sale & they were a big hit… I put dark chocolate kisses in the center. Thanks! Yuuuuummmmm… Isabelle, these look amazing! I need to make more coffee flavoured cookies and dang, that dot of chewy, luscious caramel in the centre is making me drool! My favorite Christmas cookies are Peanut Butter cookies. Your thumbprint cookie sounds wonderful! These cookies look awesome! Coffee Heath bar ice cream is my favorite!! As for my favorite holiday cookie chocolate chip with some peppermint bits! For the fall I found an awesome pumpkin oatmeal chocolate chip that was so delicious. I would love to win any of those prizes, they would definitely assist me in my baking this season and beyond! 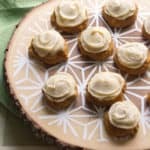 Coffee & Toffee – two of my favorite flavors in one bite – love this! Wow! These look scrumptious! Every year I make 5-6 different cookies, and every year the easiest ones are always the favorites- Peanut Butter Kisses. 1C PB, 1C Sugar, 1 Egg. Cream, scoop 1 TBSP (press with fork or thumbprint style, bakers choice)Bake, top with a Hershey Kiss. One note: If you use all-natural PB these will be crumbly. You had my attention at Skor and coffee! These would make a delicious addition to our cookie table at my family annual baking fest. I loved hearing about what inspired these cookies. Schmoopy faces and all! Coffee toffee! I just like saying the name :D I have a bag of toffee bits I’ve been wanting to use. I know what I’m making…. My favorite cookies for the holidays are decorated sugar cookies. They are a timeless classic & can be made into anything your imagination can dream up. Coffee and toffee sound like an awesome combination. I am going to have to try these little yummies. I love chubby…heck, I represent that remark. And I love coffee. And caramel. You’ve given me nothing to not love about these cookies. I love these! I love the caramel. I love the coffee. I love the toffee in the dough. These are my cookies! Pinned on my Recipes to Try board. These cookies look heavenly. Can’t wait to add them to my thumb print try this year. 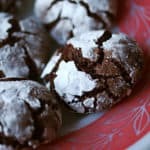 My favorite cookies to make are Snow Balls or Mexican Wedding Cookies. I have loved these since I was a little girl and helped my grandmother make them. A close second is my Chocolate White Chocolate Chip cookies. 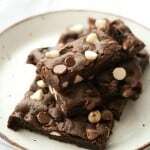 These are going on my to-bake list! Love the coffee and toffee combo! 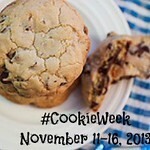 Thanks for sharing at cookie week! Thank you for sharing this fantabulous cookie recipe, Isabel. Love the flavor combo. And would love to dip my coffee toffee cookie into Greg’s ice cream! I think these are my new favorite cookies. Toffee bits AND caramel??? These just may be the BEST cookies ever!!! Umm, YEEEESSSSS!! 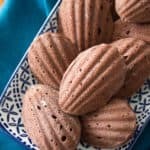 These cookies look fantastic! Save me a few? I know already that we will be having fun in the kitchen baking your scrumptious cookies. They look so very inviting! OHHH yes. A match made in heaven: caramel, toffee, coffee!! Is it wrong that I want to just eat all the toffee filling? No, okay good! Thanks for joining in the fun this week Isabelle!